The Kickstarter was hugely successful, totalling $3.8 million so when the box arrived a few weeks ago I was quite eager to play it. Sadly life has been too busy for me to find a place (and people) to play it, but last week this changed so let’s do this. I paid 35 USD for the Kickstarter pack with the NSFW add on but as yet we have yet to find a commercial place to purchase the game since it’s only just been released. However, you can register your interest and they will e-mail you when it’s ready. First and foremost let’s talk about the product I received from Kickstarter. I remember opening the package and seeing fur and on pulling out the entire box realising that the fur was not just a sleeve but the actual box is furry. Also in the box, you’ll find a 107 cards, a play mat, an instruction booklet and a FAQ card. The cards come in two separate packs and are of a fairly high quality. As you would expect the card artwork is up to the level that you would expect from The Oatmeal; the cards are fun and well drawn. Along with the main deck, I received the separate NSFW add-on deck which brings all the filthy cards, should you enjoy that kind of thing. The main instruction booklet is full of the same artwork and of a similar quality as the cards. In a very similar way to Exploding Kittens the game tells you to learn by doing and encourages you to only open the first one to learn how to play and it’s a great way to do so. You get the basic concept of building monsters and taking on the hoards of babies, who wins, how cards get discarded and so on. It’s a great way to learn the game and it means it can be taught to any new player fairly quickly. Each player is dealt a bear head and four other cards from. The rest of the deck is separated into three draw piles and placed on the playmat. All players look at their hands and scan for the three different types of baby cards. Red for air, green for land and blue for sea. If any players find a baby card in their hand they immediately place it in the relevant pile on the play mat face down and replace the card with a card from the draw pile until they don’t have any babies in their hand. The player that goes first is the person to last throw a tantrum (or pick your own inventive method). If there are four or more players then each player gets two actions and can make a choice from the following options. 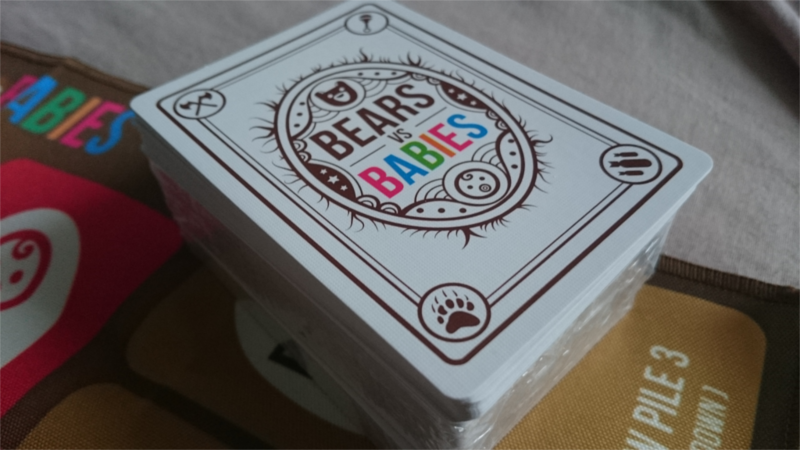 Drawing a card costs one action, there is no hand limit or minimum in Bears vs Babies. You apply the same ruling to drawing baby cards. If you pick one up then you place it immediately on the relevant baby pile, again face down. This consumes all of your actions but enables you to look through the current discard pile to find a card that you like and add it to your hand. This is needless to say a really powerful move but it does limit what you do in that turn. This also consumes all of your actions but it is the only way to win points. Choose which pile of babies you want to go to war with, yell “Provoke” while prodding the relevant baby pile you wish to provoke. We will deal with what happens when you provoke the babies next. 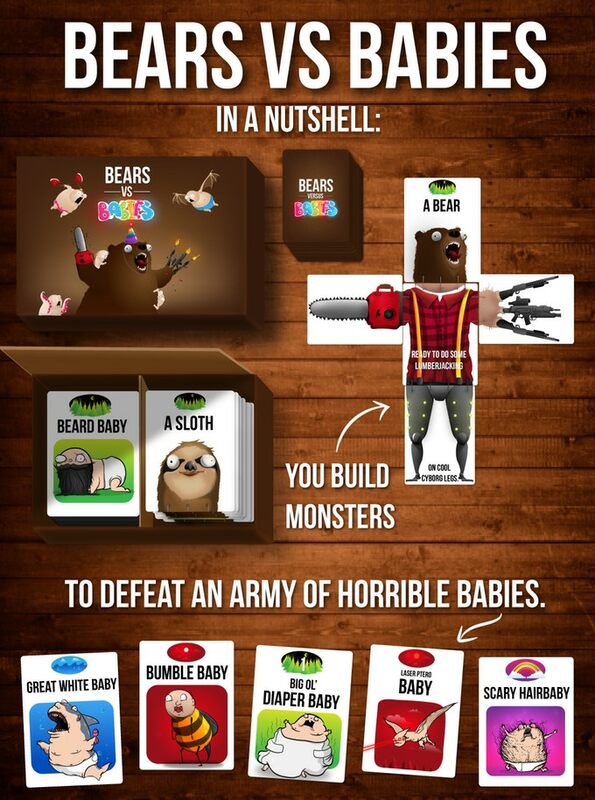 Oh dear… you have provoked the evil baby hoard, you can’t run and hide anymore it’s time to go to war. Turn the pile of babies over and add up all the numbers. Any player that owns one or more monsters that are the same colour of the pile of babies you are provoking will be taking part in the war. Players add up all the numbers of their own monsters that qualify for the war and compare it to the babies total number. There are three potential outcomes to a war against the babies. One player has monsters that rank higher than the total amount of the babies. If more than one player has a monster that is higher than the babies than the monster that is higher wins and gains all of the points won. Any monsters that took part in the war are then discarded. Oh no, this is tragic, the babies are more powerful than the monsters. This means that any monster that took part in the war against the babies are discarded. The babies are discarded too so that nobody wins the points. This is an excellent way to destroy your opponent’s monsters to give you a fighting chance. There is nothing friendly about this game and there is inherent fun in that. Your goal as a player is to gain as many points as you can by taking on as many babies as you can while all the time ensuring that all the other players’ monsters die horribly. I do feel that in order to win you have to be absolutely ruthless about it and some people might struggle with that. For the games I have played it seems to pay off if you can get a pile of babies early in the game before other people can place monsters. If you’re trailing in points then you need to be twice as ruthless as everyone else. 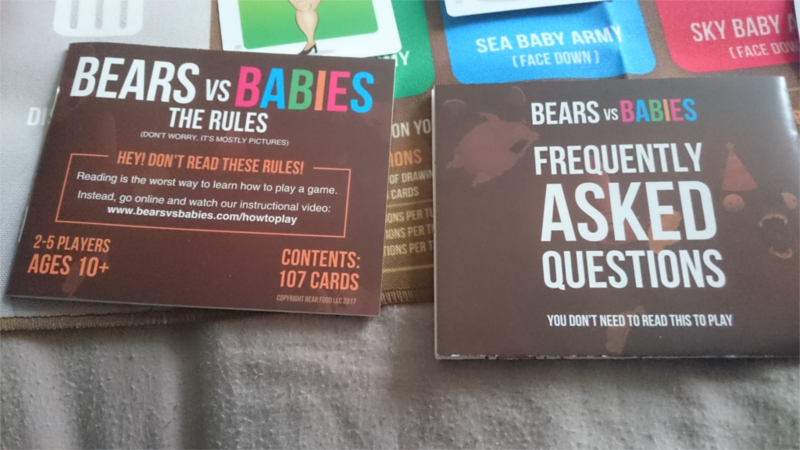 It’s hard not to compare Bears vs Babies against Exploding Kittens, I think that the tactics for Exploding Kittens came to me a lot quicker whereas it’s going to take a fair few more games for me to get to find the balance between gaining points and destroying other peoples monsters. I’m really happy with the end product. The people at The Oatmeal have done a fantastic job of delivering the product. The box is awesome, the cards are great but there is an odd feeling with the game itself. The games I have played (so far) have been more than the 20 mins stated, but I am still learning the game a bit. I was not expecting it to feel the same as Exploding Kittens but as of right now it’s not as fun but this does not mean it’s a bad game. This entry was posted on August 30, 2017 by catharsisjelly. 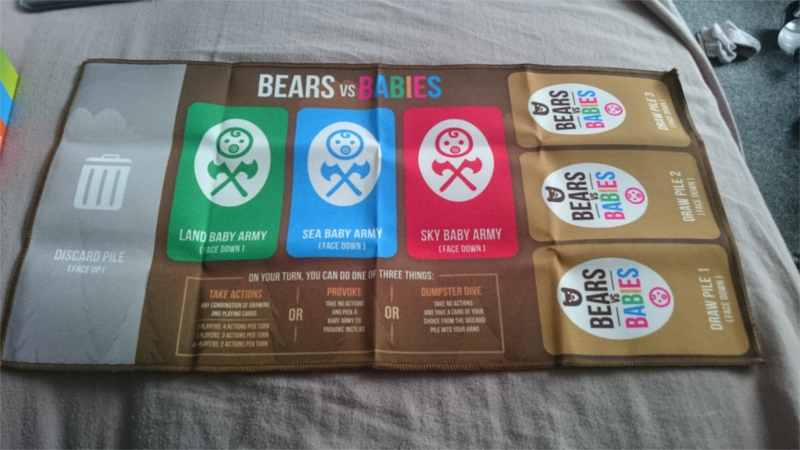 It was filed under Gaming posts, Reviews, Traditional Gaming and was tagged with bears vs babies, Bears vs Babies Kickstarter, Bears vs Babies The Oatmeal, Card Game Review, exploding kittens, kickstarter game review, Review, the oatmeal.